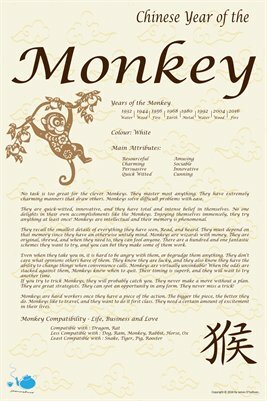 Years of the Chinese Zodiac Monkey. 1932 - 1944 - 1956 - 1968 - 1980 - 1992 - 2004 - 2016. No task is too great for the clever Monkeys. They master most anything. They have extremely charming manners that draw others. Monkeys solve difficult problems with ease.